“Will you join in our crusade? Who will be strong and stand with me? - Do You Hear the People Sing? Les Misérables hits almost all the right notes. The first time I saw Les Mis was October 12, 1990, on Broadway, at the Broadway Theatre. Life was never the same after seeing the show, seated in the nosebleeds with a student ticket. It had me from the very first dramatic beat of Look Down. This was the exciting Broadway experience I didn't get from my first-ever Broadway show, The Phantom of the Opera, a few weeks prior. The next day demanded a trip to the music store to purchase the 3-CD Complete Symphonic Recording. I've now seen Les Misérables on Broadway in three different theatres; in London, Edinburgh, Madrid, and Denver (both the original touring production and the spectacular 25th anniversary overhaul); and Arvada’s regional theatre production. Alfred Hitchcock once famously commented that Victor Hugo’s Les Misérables, an epic novel of suffering, endurance, faith, honor, duty, and romance, would make a terrific musical. Hitch was right. But does that work of art, dubbed “The World’s Most Popular Musical,” make for a great movie? The answer is yes, albeit with a couple qualifiers. The good news is the overall production quality is superb. The visuals are suitably ambitious, clearly making this movie version worthy of the big screen. Much more important, though, is the terrific ensemble cast that sings those magnificent songs by Alain Boublil and Claude-Michel Schönberg on the set as opposed to tucked away in a recording studio, thereby creating the need to subsequently lip sync their work during filming. The significance of that difference cannot be overstated. For an example of the latter strategy, check out the movie version of Evita, starring Madonna and Antonio Banderas. There is a noticeable detachment between the imagery and the vocals, it’s a separation that makes the movie rather hard to watch. By recording the music on the set, as part of the filmed action, the result is what should be expected: a seamless marriage of the aural and the visual. After all, above all else, Les Misérables’ greatest appeal derives from the music, which is written on a grand scale as it follows a set of characters along a timeline of decades. Strictly in terms of emotional resonance and musical fidelity, this movie version is a tremendous success. Since Les Misérables is a well-known musical, one that’s been playing continuously on stage for more than 25 years now, it has a built-in audience already familiar with the story’s powerful themes and characters. While the film makes numerous tweaks and minor alterations, along with some embellishments for a smoother movie narrative, those changes are to be expected. In Evita, Madonna sings Another Suitcase in Another Hall as a way to engender sympathy for her manipulative character; on stage it’s sung by one of Juan Peron’s mistresses. None of the changes in Les Misérables are that egregious and they are, by and large, the end result of simply needing to move from a theatrical sensibility to one that’s cinematic; this is an adaptation as opposed to a note-for-note transcription. That said, the focus here will be on the quality of the casting and the production as an addition to the Les Mis legacy. Director Tom Hooper (Academy Award winner for The King’s Speech) takes full advantage of the ability to get up close to his cast. The performances by Hugh Jackman as Jean Valjean and Anne Hathaway as Fantine in particular are outstanding, with close-ups of their anguish and pain adding an extra level of emotional impact in this filmed version. Both wear the poverty of the period. Valjean’s a starved wreck of a man whose past has left him, seemingly, forever tainted until a bishop changes the entire arc of his life. As for Fantine, she wants nothing more than to be reunited with her daughter, Cosette, but the struggles of a single mother, abandoned by Cosette’s father, plunge her into the depths of misery, selling her hair, her teeth, and her body for a mere sous or two. Jackman (Wolverine), who’s no stranger to Broadway, having won a Tony for his role in The Boy from Oz, and Hathaway (The Dark Knight Rises), who virtually auditioned for the role while co-hosting the Oscars, lead an almost-universally pitch-perfect cast. The most pleasant surprises come from screen newcomers Isabelle Allen as young Cosette and Daniel Huttlestone as Gavroche. In some respects, their performances are the ones most worthy of Broadway; indeed, Huttlestone previously played Gavroche in London’s West End. Then again, established movie star Amanda Seyfried (Mamma Mia! The Movie) also surprises as adult Cosette; she carries an astonishingly good voice. Samantha Barks (TV’s Groove High) as Eponine and Eddie Redmayne (My Week with Marilyn) as Marius also earn kudos for effectively filling demanding roles that figure heavily in some of the show’s most emotional songs, including On My Own and Empty Chairs at Empty Tables. Fans of the stage show should also savor this sweet, sweet bit of casting: Colm Wilkinson as the bishop. 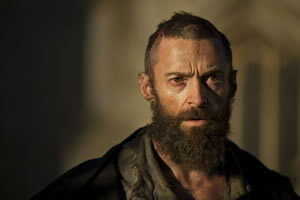 Yes, the original stage Jean Valjean is now the man who shows Valjean the power of forgiveness. Wilkinson always seem to have a gentle twinkle in his eye, but when he first appears onscreen as the generous bishop, that twinkle is accompanied by a knowing smile, a unique familiarity with what it’s like to be Jean Valjean. Wilkinson brings a special kind of magic that’s all his own. Alas, there are two bits of unfortunate casting. The Thenardiers, a slimy, nasty husband and wife team, aren’t served all that well by Sacha Baron Cohen and Helena Bonham Carter. They both performed in Tim Burton’s movie version of Stephen Sondheim’s Sweeney Todd: The Demon Barber of Fleet Street and they seem to be reprising those roles rather than relishing the much more obnoxiously and perversely gregarious characters of Monsieur and Madame Thenardier. 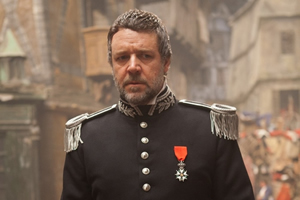 A little more difficult to evaluate is Russell Crowe (Gladiator) as the relentless Inspector Javert. Crowe certainly has the right screen presence and he’s at his best when he brings his physicality to the confrontation scenes with Valjean. But Crowe’s voice doesn’t quite have the guttural strength expected in the stage performances. On the one hand, it’s fun to watch Crowe as Javert. On the other hand, there’s a nagging wish for a stronger vocal performance. Crowe was a founding member of the Australian rock band 30 Odd Foot of Grunts, so he does have some musical chops, and, in fairness, his performance has settled in more after listening to the movie’s soundtrack. Bringing musicals from stage to screen has taken several different approaches in recent years. Chicago’s movie adaptation featured a clever presentation conceit revolving around the character of Roxie Hart. Sweeney Todd was a surprisingly faithful version that played up the horror via Tim Burton’s unique visual sensibilities. The Phantom of the Opera included a whole new set piece and, while the movie wasn’t a huge box office success, it turned out to be a respectable creative accomplishment. With Les Mis, the approach was to take the revered musical and broaden its visual appeal from the now legendary Spartan carousel staging of the theatrical production into a fully-realized vision of 19th-century France. It’s an ambition that serves the material well. Highlights including One Day More, Lovely Ladies, and Do You Hear the People Sing? all come alive in exciting fashion. The most notable departure here is the addition of a new song, Suddenly. No doubt it’s the (to be expected) ploy to earn the movie an Oscar nomination for Best Original Song. It’s a relief this new material fits in well enough; it’s a quiet, unobtrusive song that does help in the development of Valjean’s character. He’s gone from a single man on the run to mayor to adoptive father of a young girl. Sure. That’s worthy of a song. Let it be. Once all is said and done, Les Misérables offers up a tremendous amount of creative success that is only slightly dampened by a couple weak choices in the casting. Of course, the preference is to experience Les Misérables live on stage, but this movie version is easily accessible, a mass-media production that can expand the fan base and a worthy addition to the musical’s legend.